Several years ago, I read The Queen of the Tearling and fell in love with the unique world and powerful heroine. 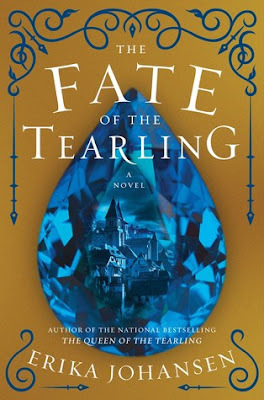 The The Fate of the Tearling went in an unexpected direction, but I still loved it. I was sold on Johansen's creativity and the way she wove multiple genres together. When The Fate of the Tearling came out last year, I'd planned to read it right away... but never got around to it. Since so much time had passed, I recently decided to re-read the first two before finishing the series. And that's where my problems started. I did an audio re-read of The Queen of the Tearling and was surprised to discover that a narrator I'd previously liked just didn't click with the series. I've enjoyed everything else from Katherine Kellgren, but something about this book left me wanting more. There were times it felt like she was yelling and the forcefulness of her narration was off-putting. But I knew I'd finish it so much faster on audio, so I stuck with it. I still cared about the characters, but I wasn't as invested in the story. So, I changing my rating to So Enjoyed It. Then, I started the audio for The Invasion of the Tearling. Davina Porter narrates that one, and I was immediately annoyed by the change. Although I didn't love Kellgren, I'm not a fan of mid-series narrator changes. Porter has a lovely voice, but she didn't fit the series either. Kelsea is a teenager, and Porter sounds so much older. The book isn't written in first person, but it still didn't strike the right tone for me. This is when I started to realize that re-reading really was making me like the books less. Things that I'd found creative and surprising on my first read felt weird upon re-reading. The pace dragged, which made me feel like it was taking forever to finish it. And by the time I did, I realized that it was just a So Liked It. 1. The NUMEROUS plot holes. 2. The unnecessarily convoluted storylines. 4. The weird changes to several characters. 5. The horror movie demon spawn (because obviously this series needs one more genre added to it). 6. The anti-climatic "who is Kelsea's father?!" reveal. 7. The completely depressing tone. 8. The nonsensical way magic works in this world. 9. The super offensive anti-religion themes. Y'all. I am so annoyed about numbers 1-9 on that list, but all of it pales in comparison to my utter rage at the ridiculous ending that invalidated the previous books. I want to talk about it here, but it would also be major spoilers. So, I'll be a good blogger and avoid them. But honestly, I think I might have preferred an ending where everyone died and the theme was essentially "utopian societies will never work because of human nature." Yeah. Everyone dying ranks higher on my wishlist than what actually happened. WHAT A WASTE OF MY TIME. Can I rescind a recommendation? Because if so, that's what I'm doing. These books no longer have a place in my home. They're not technically in my trash because you better believe I want to get some credit at the used bookstore for them so I can rise from the ashes of this dumpster fire and buy myself something better as a consolation. I know everyone loves the phrase "if you can't say something nice, don't say anything at all," so just pretend this review had no words if that's how you want to live.